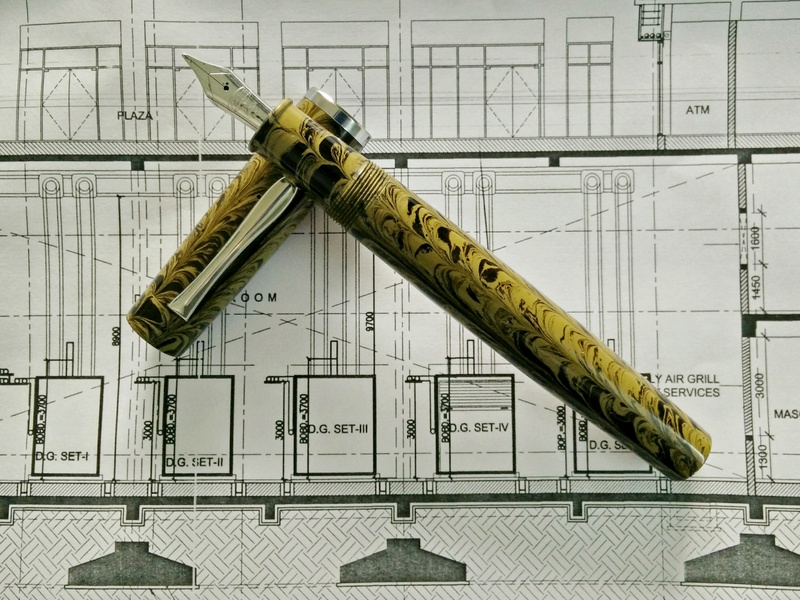 The review is about my second oversized pen ASA Viraat that i bought along with the Gama Supreme which I will be reviewing later. 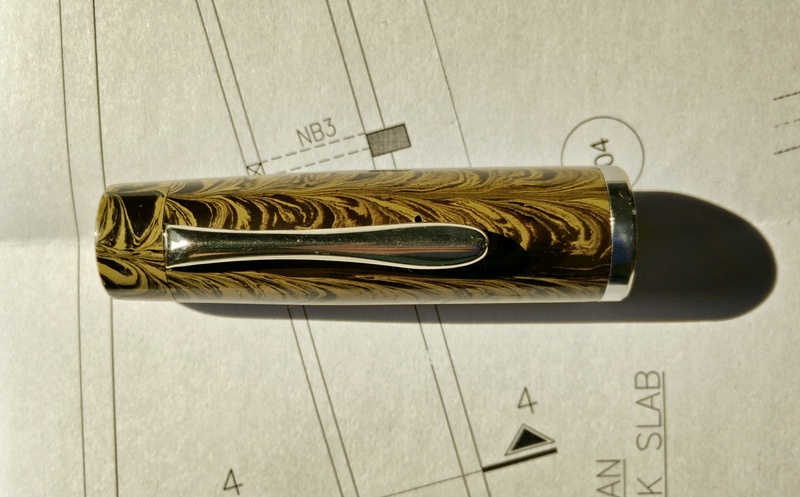 This happens to be custom job that he did for me and supposedly upcoming model in growing list of ASA Pens. 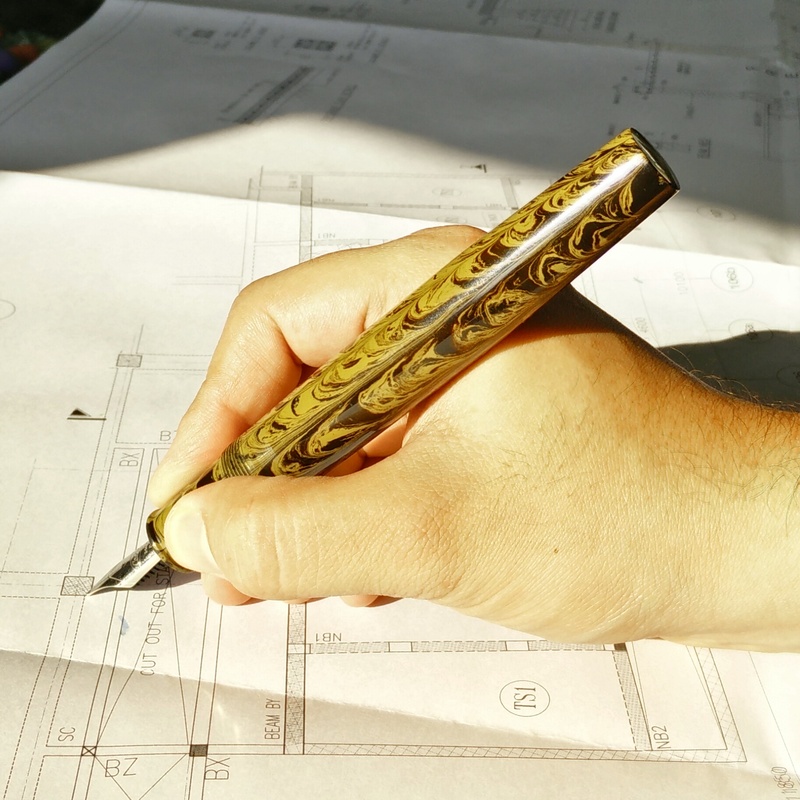 This pen comes in two ebonite colors like black, light brown rippled, dark brown rippled. 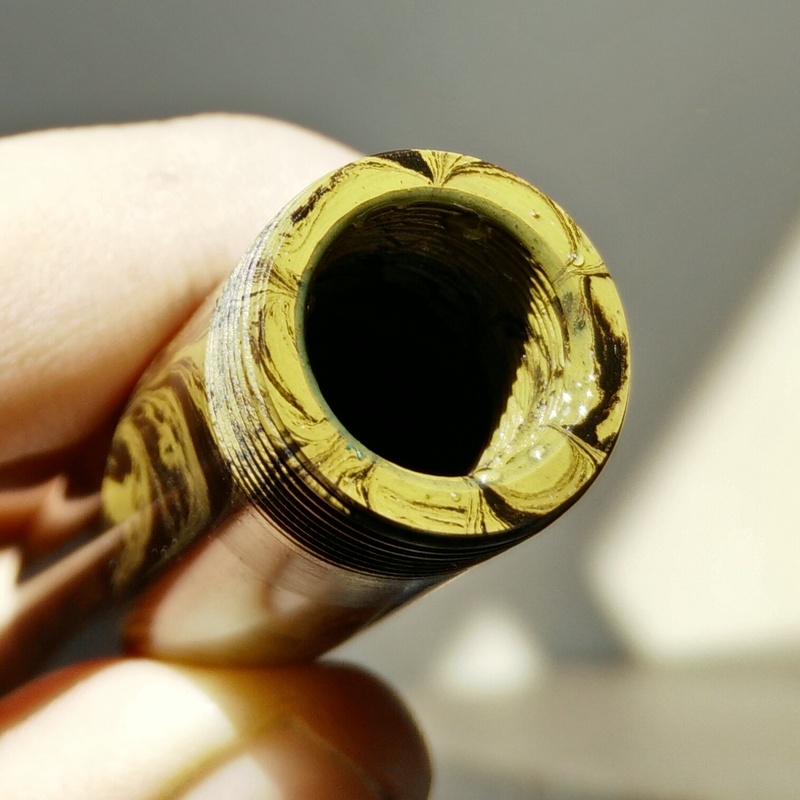 The pen in review is light brown rippled often called as White Tiger Ebonite. Built wise its a amazing, thick and the quality of the ebonite used is top notch. No qualms about it. 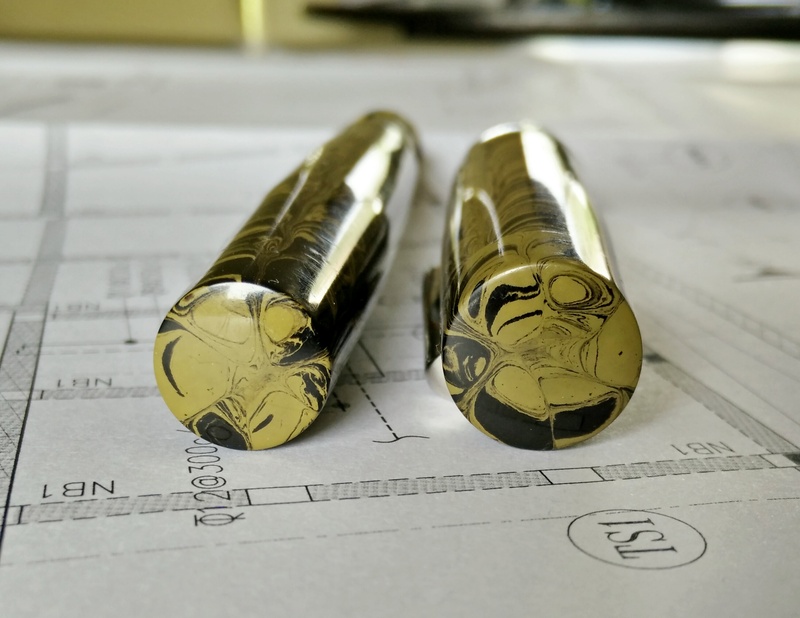 Also there are two option of finishes available for this pen, Polished and Matte. 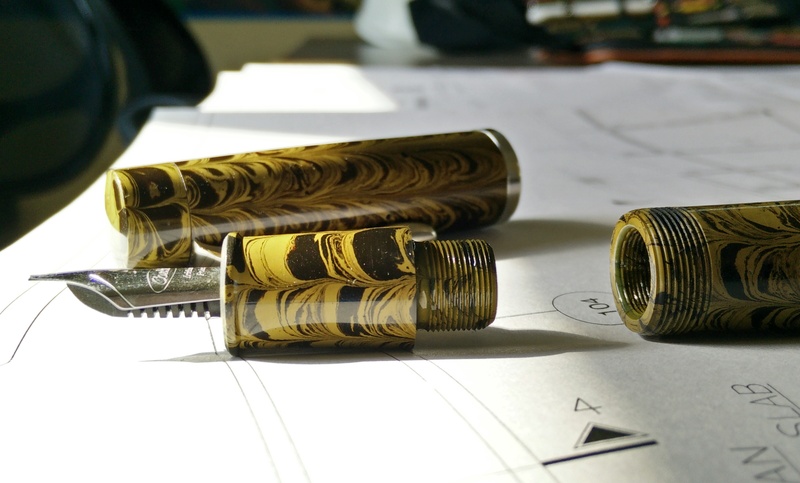 Matte being new finish on the colored ebonite from ASA Pens. I am using the Polished version which can be seen in the image below. 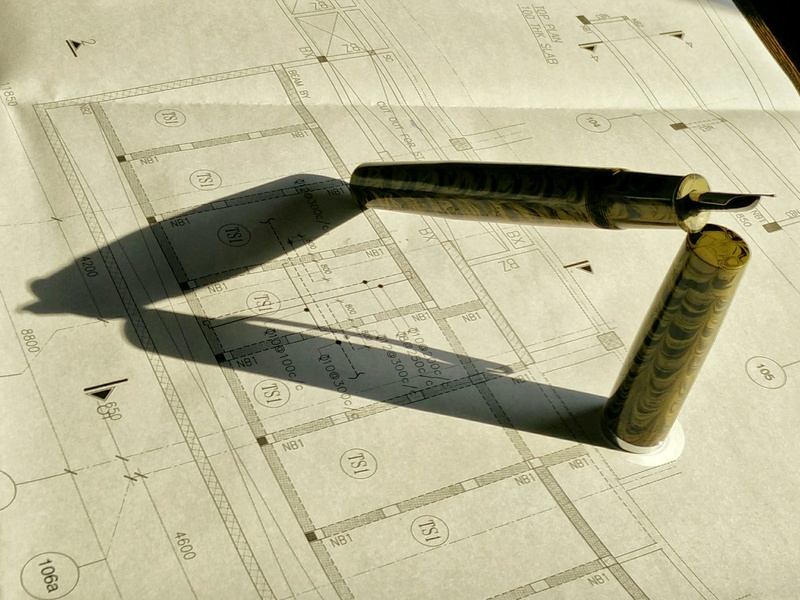 The thickness of material is amazing. Its built like tank. Throw it here and there and forget. No damage will happen to this tank like built pen. 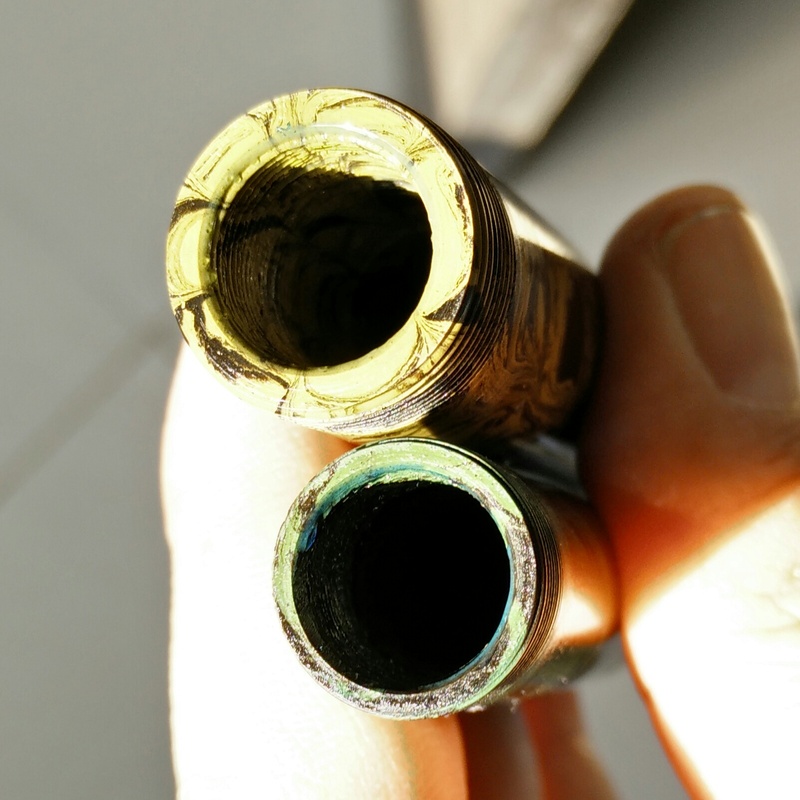 The pen is fat and average thickness of pen is 15 mm, with maximum thickness at 16 mm around center of barrel and then barrel tapers down to bottom to 14 mm. Compared to Gama Supreme it is smaller by 4 mm in length. 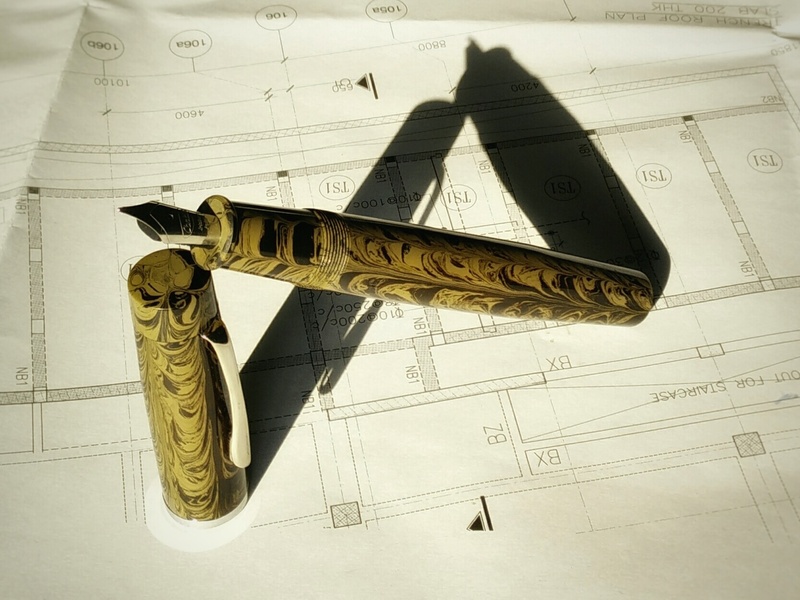 The pen is around 160 mm in length which is quite big. The cap is @17mm dia at bottom and @16mm at cap finial. The clip is quite stiff and sturdy. 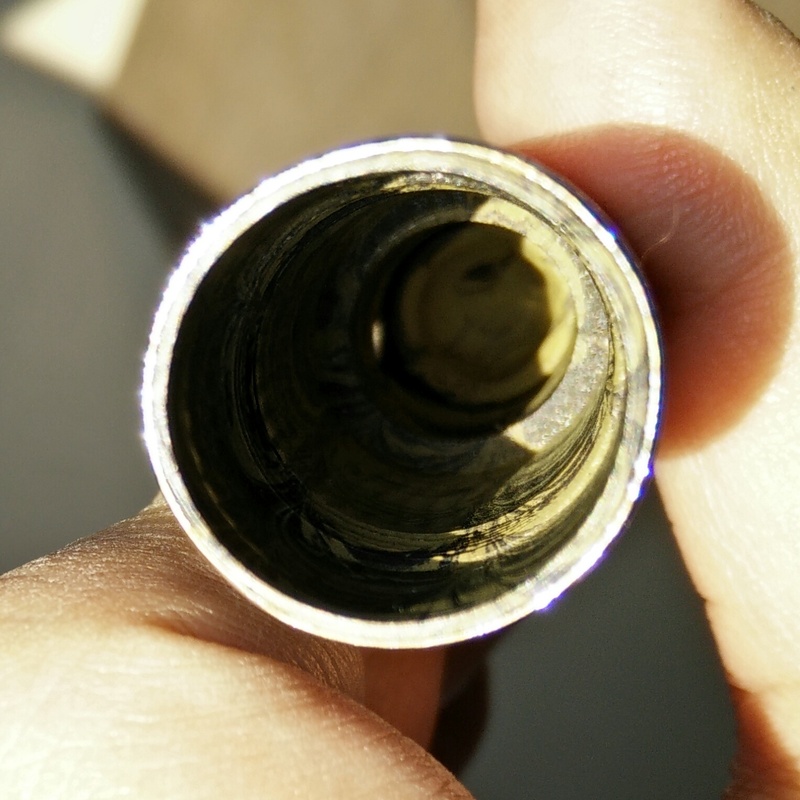 Also there is a band at the edge of bottom of cap called lip band. All the trims are in silver chrome finish. I personally dont like the lip band but that doesn’t discount from the fact that it is well executed pen. Some people may like this some may not. The grip section length is small though. 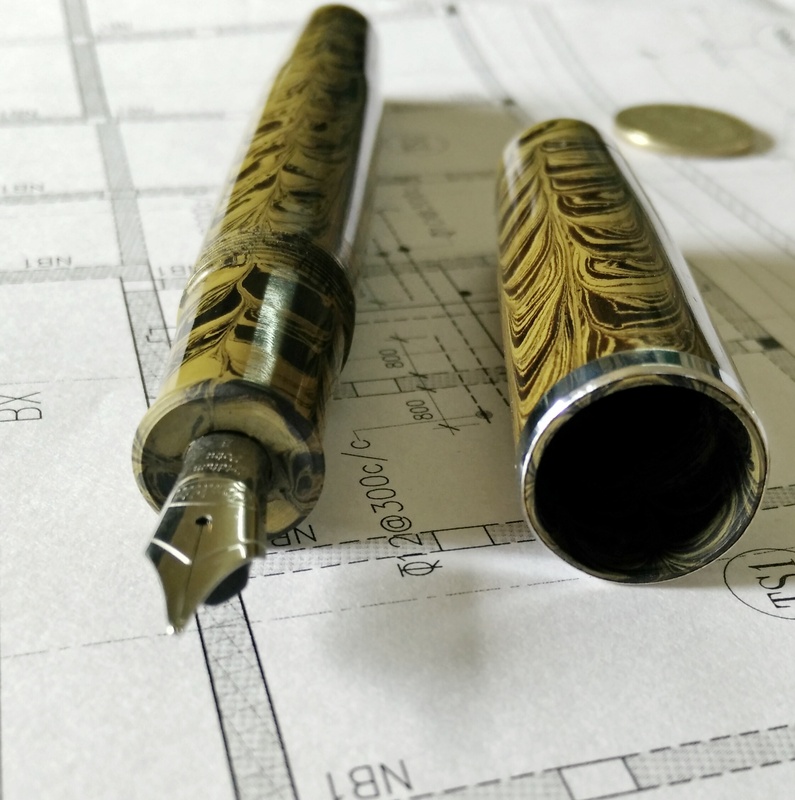 The pen is flat top and bottom design with certain amount of tapering towards at either ends.Overall its a simple design for a pen but in big proportions. Quality is top notch. 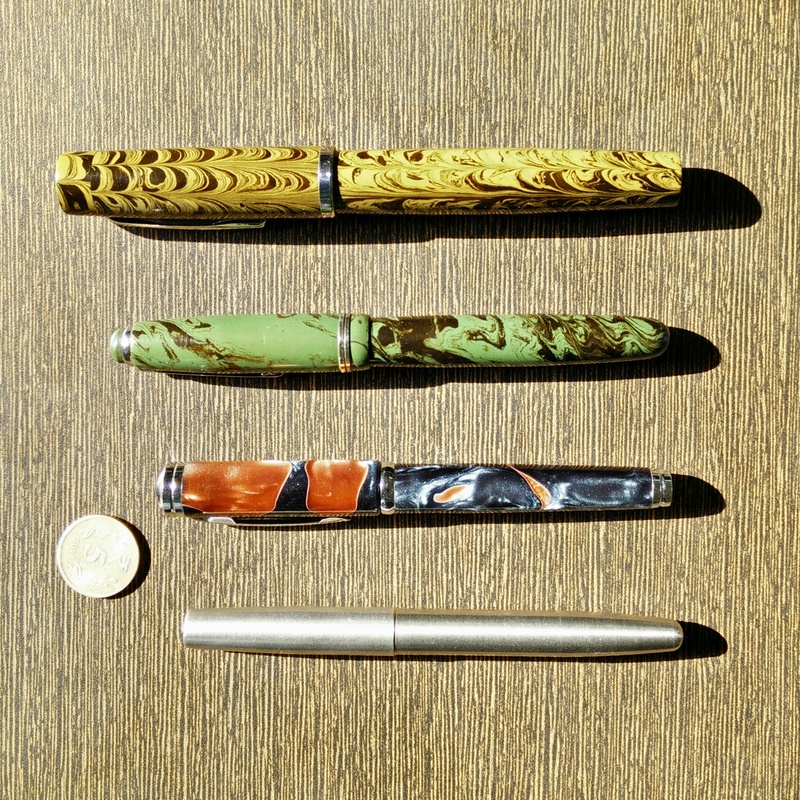 Below are the few images showing its comparison with other pens. 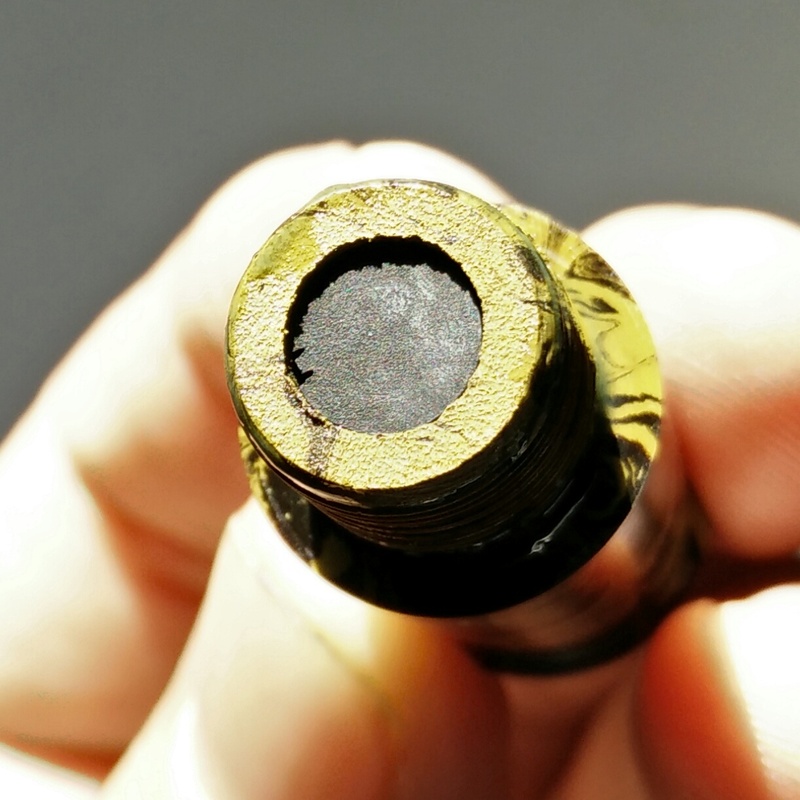 Few vitals are that the cap opens in 4 turns and the grip section is 13 mm thick. 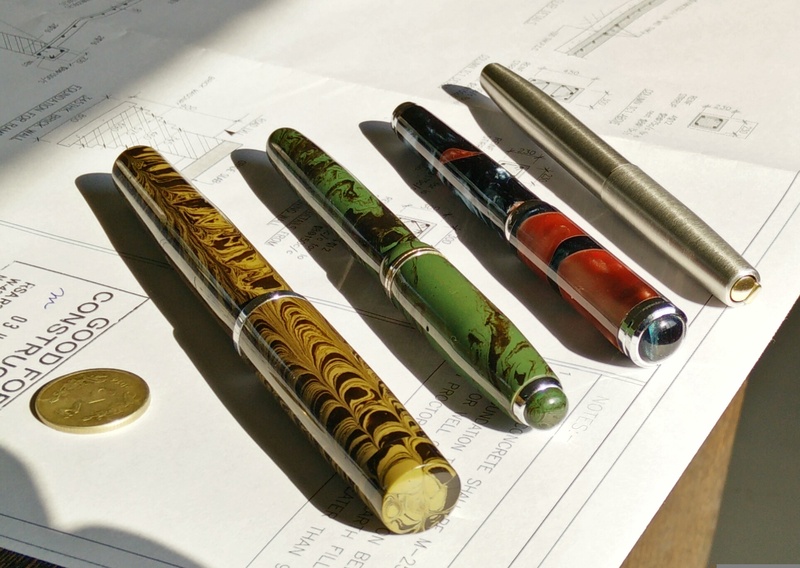 The pen of these size are generally heavy but being ebonite its light weight. 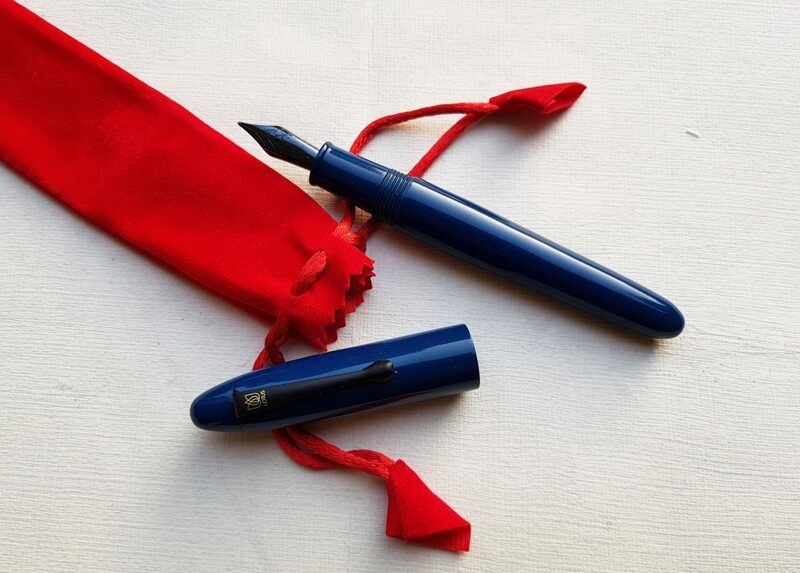 But because of its size there is just a little amount of welcome heft which make you feel that you are actually holding a big pen. The cap posts securely at back but i don’t think that is required. As mentioned earlier the grip section is small though and might be hassle for some. who hold the pen a bit higher. 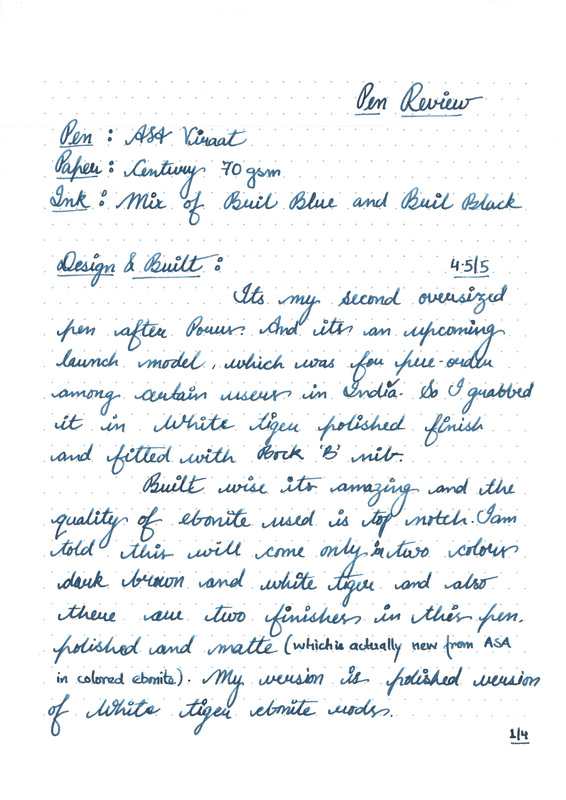 ASA Viraat – Writing without cap posted. 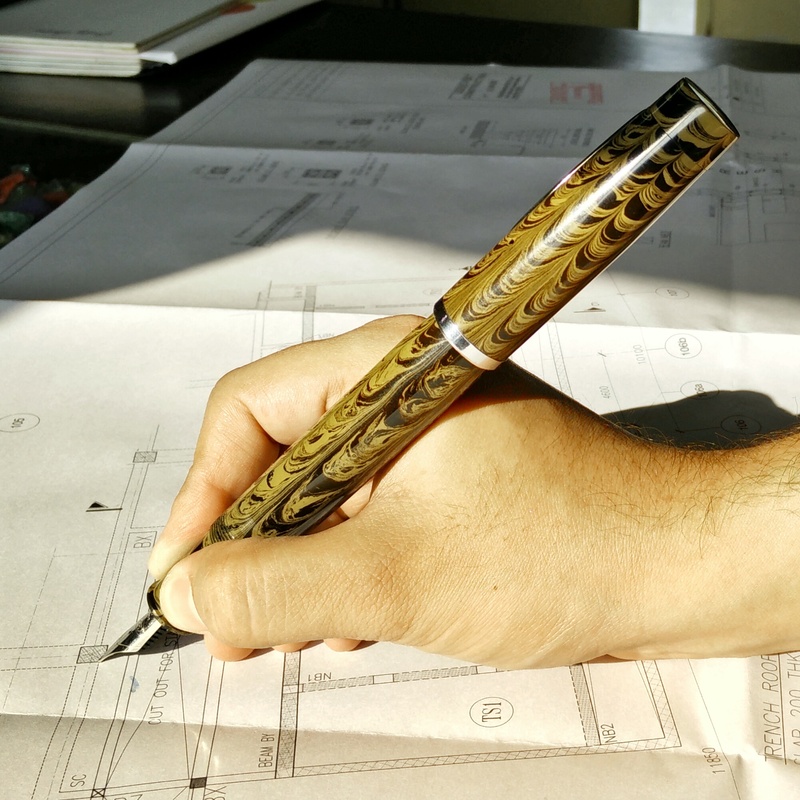 As you can see the pen is quite big, thus no requirement of posting the cap at back. Also you can see the grip section being small in length and my grip touching the threads which actually are not sharp and provide slip resistance. Actually this thick section takes some time getting used to. 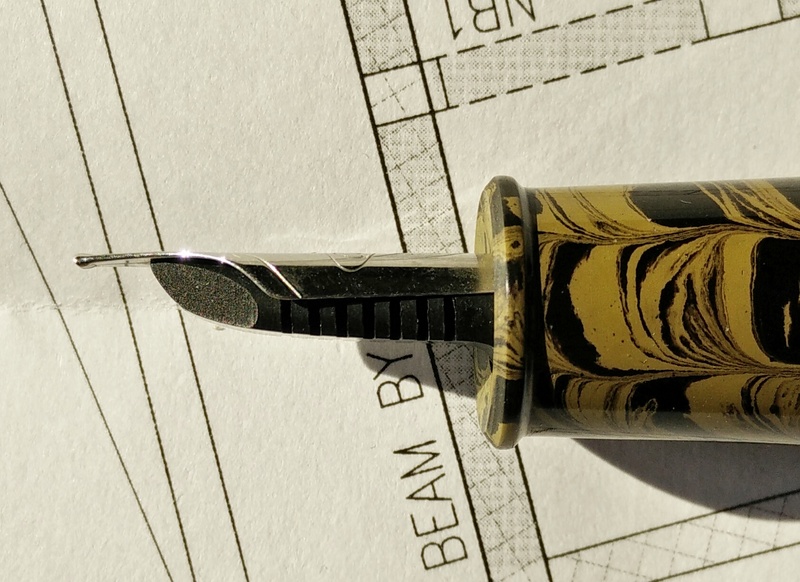 Now the pen is fitted with Broad Bock nib. 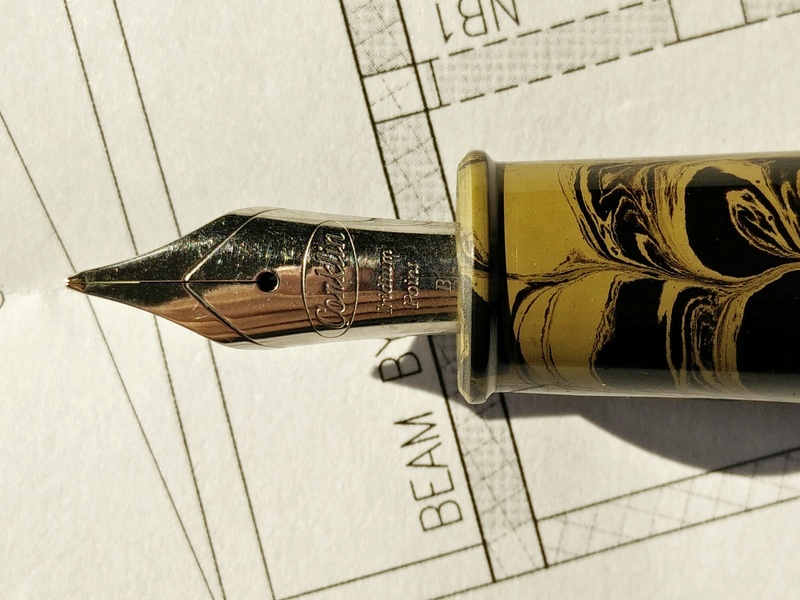 Oh man l love this nib. Lovely. 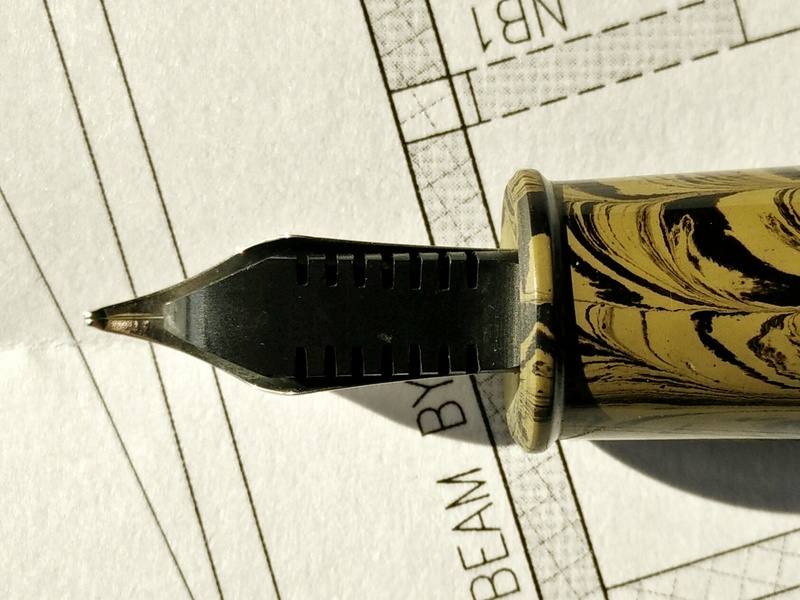 Lays down perfect wet line that broad nib is supposed to do. 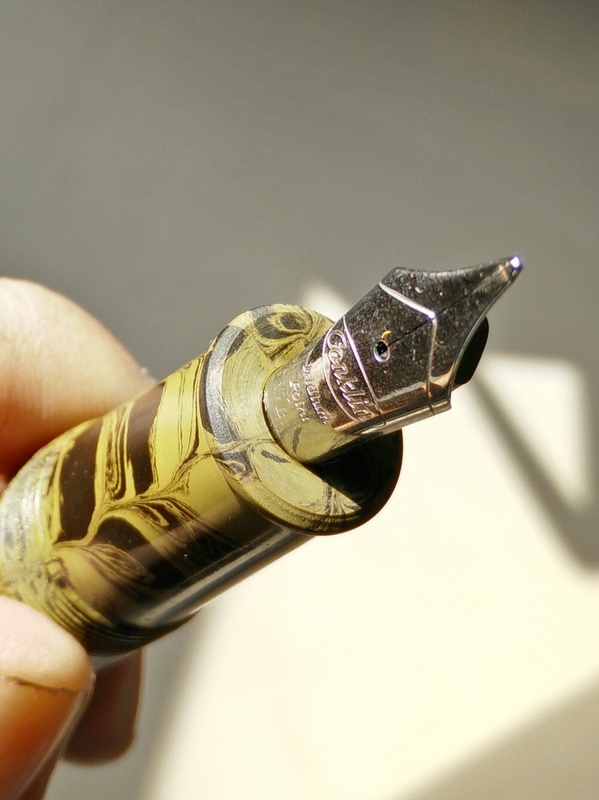 Pen is an eyedropper filler. 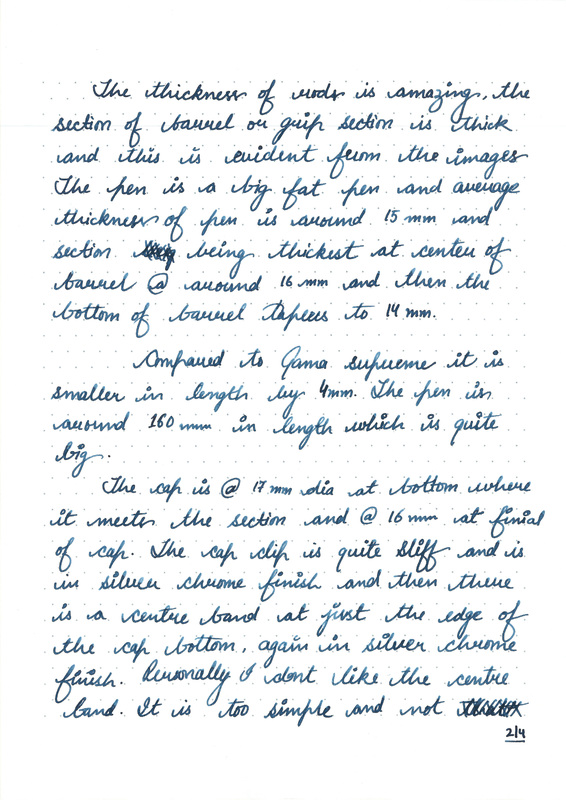 And hold approx 5 ml of the ink. Feed is made of ebonite. 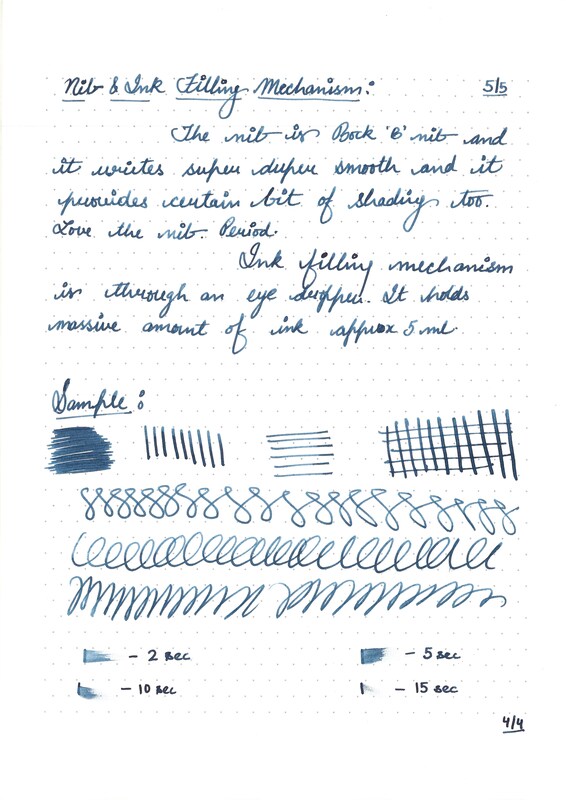 And following nib options are available. 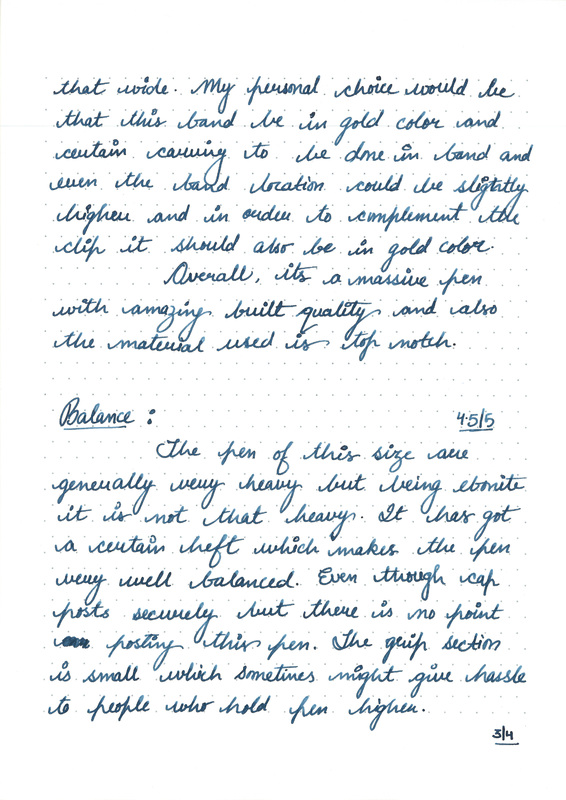 Below is the handwritten review showing the writing sample and ink drying tests. 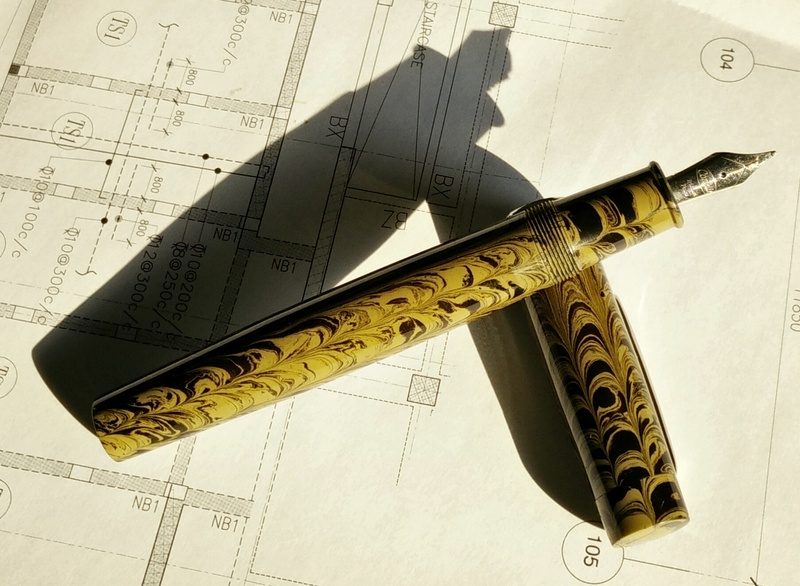 This pen is for the serious buyers who actually are on lookout for oversized beauties. And this is one of them. How to get an ASA VIRAAT like this one and one in cherry red ebonite ? Is it possible to get these in USA ? How to buy ASA virat pen.waiting for your valuable reply. I’m looking at this tiger and thinking it might eat the Parker Frontier for breakfast! 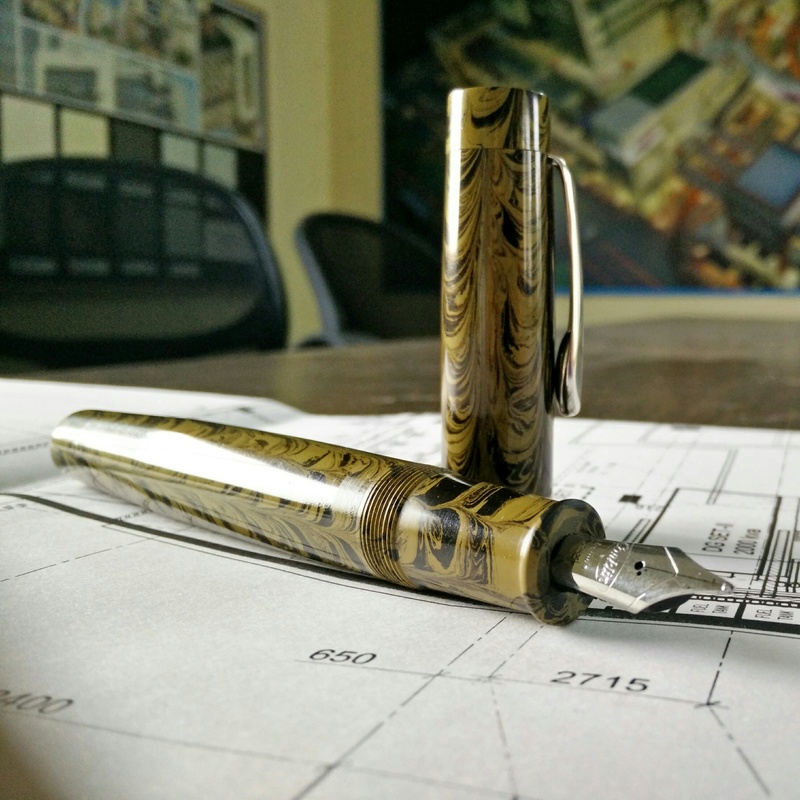 Interesting read – and a very good looking pen. 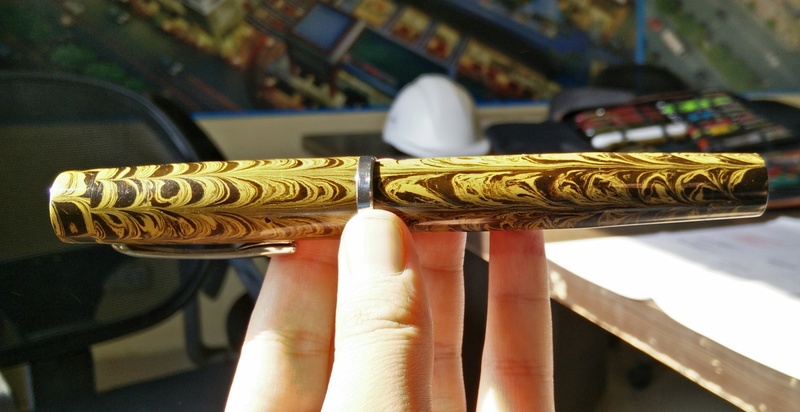 A very unique fat pen, the ebonite seems more beautiful when they are oversized in my observation. The pictures are of very high quality. Review is very nice. Good crisp and interesting read of ASA Viraat. Has it been launched ?? Is it available on the website.